Lawyers often focus on the core elements of hardware technology: computers, tablets, and smartphones. However, the best experiences with hardware are driven by and dependent on the way we accessorize and personalize them. Most people choose their technology accessories based on word-of-mouth recommendations from friends, family, colleagues, or other connections. So what are lawyers using and buying today? 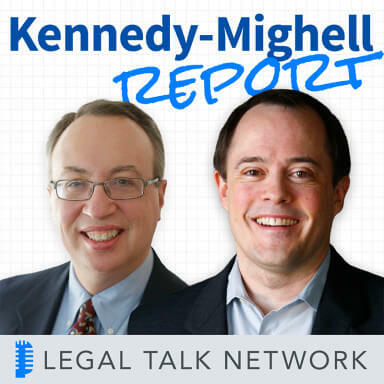 In this episode of The Kennedy-Mighell Report, Dennis Kennedy and Tom Mighell talk about accessorizing technology, discuss some of their favorite accessories, and recommend ways lawyers can accessorize their smartphones, laptops, and tablets. Kennedy and Mighell have some favorites that they want to share and they would like to hear about your favorites too! In the second section of the podcast, Kennedy and Mighell discuss multi-factor authentication. While there are several options of apps and systems to avoid hackers, all lawyers should consider ways in which to make their accounts more secure. As always, stay tuned for Parting Shots, that one tip, website, or observation that you can use the second the podcast ends. Dennis Kennedy: And welcome to episode 148 of the Kennedy-Mighell Report. I’m Dennis Kennedy in St. Louis. Dennis Kennedy: In our last episode we revisited the idea of the paperless office. In today’s episode, we want to consider the ways we actually use and personalize our on technology to create a better experience with it. Tom, what’s on our agenda for this episode? Tom Mighell: Well, Dennis, in this edition of the Kennedy-Mighell Report, we’ll be talking about the accessories that we like to use that help us use technology better. In our second segment, we’re going to take a look at multi-factor authentication as a way to protect your data and your identity. And as usual, we’ll finish up with our parting shots, our one tip, website or observation that you can start to use the second that this podcast is over. But first, let’s get started on our main topic, and that’s accessories and personalization. We talk a lot on this podcast about the type of technologies that we use, but we don’t spend a lot of time talking about accessories. The tools that make it easier to use that technology. Dennis, it was a Facebook post, I think, that gave rise to the idea of this podcast. What were you looking for when you posted it earlier this week? Dennis Kennedy: I decided in my constant quest to find this suitable replacement for Google Wave as a way to have these discussions where I can ask a question, get answers from people who are experts, I decided I’d try to experiment with Facebook. So I had gotten this new Tortuga travel backpack I’m really excited about; and so that would be my carry-on overhead backpack. So then I was thinking, what would be my second bag that would typically carry my laptop and that sort of thing. And then I said well, if I have a backpack, I think I’ve got to go to a wheeled case of some kind. So I started to look and as luck would have it, I went to this Tumi store where I saw two really cool wheeled laptop bags. Really well thought out, I really liked both of them and the one I liked the most was $825, which was probably about eight times what my budget was for this wheeled laptop bag. So I just asked all my friends on Facebook who do tech and travel and see if there’s a consensus these days. And so I got some good suggestions and I got a lot of criticism as well, sort of making fun of me for even wanting to have a wheeled bag. So I realized a couple of things as a result of that, one that there was not one clear choice, and two that the answer really does come back to the old, it depends on what it is that you need and want. And so what I decided was more important than the wheel was that I wanted to make sure I had a bag that would fit under the seat in almost every airline situation I found myself in. So the wheeled bag just seems like it’s problematic for that reason. So it really started to make me think about not only that bag, but how I came to the decision to get that Tortuga bag, the fact that the Tortuga founders have a podcast called the Power Trip Travel Podcast, which is great; and as I started listening to it it almost made it impossible for me not to buy their bag because I liked what they were doing so much. And then I also realized how the accessory thing is also a lot about personalization and personalization over experience. So to make a long story short, Tom, I found myself after pretty much deciding that I needed this wheel bag to now being at a point where I’m like, I’m going to try to experiment with what I already have for a while and not make a decision at least for another six months. So that probably doesn’t surprise you, Tom, knowing me for as long as you have, but that’s the whole upshot of the Facebook post. Tom Mighell: I tend to work in almost exactly the opposite direction, because once I have made up my mind on what I want to get, if I have decided that I want to get a new bag, I would – and I may have gone ahead and asked the question for it – generally, my approach is to take a look at reviews and see what people say online, although, I suppose that when you ask your friends, you’ve got a couple of legitimate responses but a whole lot of ribbing and responses that weren’t helpful in particular. But what I do agree with is that these decisions are intensely personal. And when it comes to a bag that you’re going to use, I think that becomes even more personal. Some of the accessories that we talk about today, there’s not a whole lot of difference between some of the things that we talk about and having one over the other doesn’t really matter. But having a bag I think makes a big difference. It’s something that you’re going to be using for maybe a long period of time, it’s something that you have to get used to. It’s this place where all of your stuff goes and I think that that’s reason to make a more deliberate approach to that if that makes more sense to you. I happen to be more impatient, so once I’ve made a decision on it, then I pull the trigger and boom, there it is. And sometimes I live with regret and sometimes I’m insanely happy because I made a good choice. But I think that part of the issue is that there’s just so many options these days. Back when the iPad first came out, for example, I would recommend one or two different keyboards and I still recommend only one or two different keyboards, but the number of keyboards available with the iPad has expanded just exponentially, because everyone’s making it and they are of random qualities and types and varieties that you really have to make the research and study it yourself and decide what’s important to me. And as you say, what is the job to be done that you need this certain accessory to accomplish with, and hopefully you make the right decision. Dennis Kennedy: I think that also there is a notion these days and I don’t know if it’s a particularly millennial thing or it’s just a sign of the times of what we all want of we like to have things that are really personalized to us. And so you have that Moto X phone and sometimes you see in cars, clothing, other things that you can really personalize a lot of things and that sort of seems what people want. As I sort of look into this, if I think about how I’m using these things and where I’ll be, that I need to think through what impression so I make. So if I’m a speaker, do I want a certain type of bag, does it need to be more modern, there’s the fact that I think it would be cool to have a distressed leather bag that developed a patina over time, might that be cool or does it even fit with everything else that I have; and so I have to coordinate things. So I think there is that personalization element that really does come into the notion of accessories so both the helpfulness aspect and then also the personality aspect I think are both involved in accessories. So I don’t know, Tom, should we kick off what our favorite accessories are? Tom Mighell: Sure, since we’re talking about bags, why don’t we talk about bags? Dennis Kennedy: So my current daily laptop bag comes from Chrome Industries and it’s called the Soyuz. It’s a backpack with a really cool inside zippered sleeve for file folders and a laptop that you can pull out from the side of it. It’s expensive, it’s a $160 backpack; I got it for half price, I got it for $80 which really makes it great. Holds a lot, really heavy duty, really comfortable in a lot of ways; some tradeoffs, it’s not the perfect bag for me but I really like it in a lot of ways. And I’ve really gone to the backpack approach because when I use the shoulder bag, it seems that I get out of alignment somehow and I get sore and uncomfortable. So this replaced a Swiss Army backpack that I used for years that I really liked, which had a lot of pockets and zippers and sort of things. So the Chrome Industries thing, which are a cool messengers company with a more urban kind of feel to it; their approach is really cool and I like the heavy dutiness of it. So that’s my latest bag which is probably about as far from the leather briefcase Tumi wheeled briefcase as you can get. Tom Mighell: I went a couple of years ago to the backpack as well, for pretty much the same reason; I was using a shoulderbag that was hurting my shoulder. I started carrying a little bit more in the way of accessories and then when I was travelling internationally, it just made sense to have a backpack with me and a backpack that could carry a whole lot of stuff. So I’ve been a fan for a number of years of Tom Bihn bags. The current backpack I have right now is the Tom Bihn Brain Bag. I wouldn’t call them luxury bags, but I would still call them high quality; they’re very strong bags, they’re indestructible. I have never seen wear and tear on any Tom Bihn bag I’ve ever had and I’ve had a number of them for several years and I can throw them anywhere and they will bounce back and have no problems with them. What I like about Tom Bihn is that they have accessories for your accessories. So you can buy the Brain Bag, it’s basically empty inside, it’s got a ton of room in it but you can accessorize it. So I have in one sleeve I have something called the Freudian Slip. You can use it to store papers or pens or accessories, small accessories that are part of that, and it slips right into one of the pockets of that. They have one thing called the Brain Cell, the Brain Cell is another insert that will safely protect your laptop and there’s a horizontal version and a vertical version in there. It very tightly protects your laptop so that it doesn’t get hurt; tons of great accessories that are part of it. Now that I have my Surface Pro and I’m travelling with that, this backpack is probably too big for a laptop bag, it probably is bigger; but I really carry a lot more accessories as you will find out as we talk more during the course of this. So I actually really appreciate the extra space, it’s nice to have that. So let’s move on from bags, let’s talk more about personalized accessories and talk about phones. I’ll make mine simple, which is that I have the confession to make that since I now have the Moto X, I actually don’t have a case right now that I’m using. It’s such a nice-looking phone. The cases for it really bulk it up and take away from that, it’s very thin and like you said, it’s personalized. I’m taking my life in my hands when I carry it out with me. I already dropped one Moto X once and cracked the screen, but even though it’s Gorilla Glass – I know I’m asking for trouble, but right now I think the best case for my phone is my pocket. Dennis, what about you? Dennis Kennedy: I go simple here, I really like the standard Ampli-Phone, leather case, which is at least according to rumor, if not fact, which was designed by Jony Ive. But what I like about it is that it’s simple, sleek, black leather. I think it accentuates the slimness of the iPhone and it looks good, it feels good in your hand; I accidentally dropped my iPhone this morning, I guess in preparation for this podcast, and it protected it just fine. But I just really like the look of it. Like I said, to me it just fits and compliments the iPhone feel really well. Tom Mighell: And so while we’re on the subject of iDevices, what are you using for your iPad? Dennis Kennedy: For my iPad, again, simple, I like the smart covers of my earlier iPads, I’ve now gone to the iPad Air 2 case which gives you the Smart Cover which is very versatile and flexible and turns your iPad on and off. But the thing about the Smart Case is that it wraps around and protects the backside of it as well because it used to be that the Smart Cover just protected the front and you had the back part exposed which could get it scratched or whatever. But this kind of wraps it up really nice and snuggly. I like it a lot, the only drawback I have is that sometimes when I go to put the charger into it, it’s pretty easy to miss the slot that you need to put the charger into and it sort of slips underneath the case and the actual iPad and so you notice that your iPad isn’t charging because you haven’t got it into the right slot. Tom Mighell: Or any slot at all, actually. Tom Mighell: I’ll second the iPad Air 2 Smart Case, I use the case as well. I used to have the Smart cover on the earlier iPad because I thought that having the case made it much too bulky, but now the iPad Air is so thin that the total case really doesn’t add to the bulk, I don’t think. It still is a thin, nice case; it’s durable, it’s a good quality case so I like it. And like you said, it protects the iPad all the way around. I think that we could probably do an entire podcast on accessories for charging things or power outlets and charging your various accessories, but let’s maybe try to condense it into 3 or 4 minutes to talk about the kinds of things we use. I know that any good legal technology person is going to bring along some type of portable powerstrip and I know that I’m not an exception of that, what about you? Dennis Kennedy: Yeah, I just think that even if I’m not speaking, I really like taking a powerstrip. Sometimes I’ll even take a cheap extension cord as well, I figure if the outlets are hard to get to and you’re sitting in the audience, if you have an extension cord, even a cheap one with 3 extra outlets that you can make friends of at least 2 people if you plug it in and suggest that you share. And I find in a fair number of hotels there’s a limited number of outlets that you need so there’s two things that I like. One is the Monster outlets powerstrip which gives you four outlets; really handy, wraps around itself and it’s really easy to carry. The only downside that I found on the one that i had is that it has an incredibly light blue LED, so it really emphasizes the need for a sleep mask in a hotel room. And the other one that I like a lot is the Belkin SurgePlus 3-Outlet Mini Travel Swivel Charger Surge Protector with dual USB ports. Again, the first one is $11, this one’s more like $20 or so, and it’s great. Again, pretty easy to pack and it gives you the two USB outlets and it’s so helpful when you’re in a hotel room or any place where there’s a limited number of outlets. Tom Mighell: I’ve noticed lately that in hotels – like you said, there still are a lot of hotels that haven’t figured out that they need to put more outlets at the desk level – but what’s interesting to me is that hotel rooms are getting with it in terms of putting outlets at the bed. So I’ve been at the last couple of hotels where there’s two outlets at the bedsides but nothing on the desk; which blows my mind away unless they’re expecting you to do work while you’re in bed. But I’ll second the Belkins SurgePlus; I’ve got that, I use that. Like you, I was at the most popular place in an airport whenever people needed to charge things up. I’m noticing in airports now that there are a lot more charging stations and tables that have plugs built into them and chairs that have plugs built into them that I don’t find myself actually using that often there. But I tend to use it a lot in hotel rooms just for that reason that you mentioned that is that until hotels figure out power and how to do it, I’m still going to make sure that I’ve got that Belkin. What happens when you’re out on the road, Dennis, when you need to charge a device; or do you ever bring battery power around or anything like that when you’re maybe in the car or other places? Dennis Kennedy: I’ve got a couple of the portable battery packs, I try to bring one whenever I’m out. I’ve really never used one because I’m a power vulture, I think. I’m real careful about the power I use and I’m always looking for an outlet; but I usually carry at least one. One of the things I really liked for about $10 was just getting a dual USB port device for car charging, just plugs into what used to be known as the cigarette lighter but now is the power plug in your car. That’s nice because it gives you two USB outlets to use so if you have a couple of devices – which is not surprising these days – or if you’re driving with somebody, that makes it really easy. So that’s an easy $10 and I usually have one or two of those in my car. It seems at the end of last year, people were giving them out at exhibit halls too, so you could usually pick up a couple of those. Tom Mighell: I don’t drive to work every day so that’s less of an issue for me but lately I find myself on long driving trips, traveling for work this week. I had to drive about an hour and a half from the airport to the town that I was going to be staying in. And although I love my Moto X, the battery life is not the best and using Google Maps can literally almost drain the entire battery just in an hour and a half. So I have two ways to deal with that; I’ve got a portable charger, a battery pack, but I also have one of the same car chargers that you have that I bring with me. Both of them are from a company called Anker; you can’t go wrong with any tool from Anker. They have tons of different types of chargers from larger, more powerful external batteries to the more portable and light and easy to use chargers like this, the 4-port car charger – was $15 from Amazon. The bigger ones are obviously going to cost you a little bit more, but they pack a lot of battery storage that are part of that. And really, Anker carries a charger for just about any preference that you’ve got. Dennis Kennedy: So my biggest area of accessories is in audio and I’m afraid to count the number of headphones that I have. I have a bunch of job specific headphones that I have. The new Bose noise-cancelling ones for planes, I have some for when I work out at the fitness center, at my work I have some for the treadmill here; I have different ones for different things I do. They all make sense in my wacky world of why they’re better and I personally blame it on a website called InnerFidelity.com, which tells you the best headphones to get in all these different categories. But I think it’s an example of both the personalization and the accessorization of how you want to have headphones that reflect the way you listen to things that might reflect the way you want to look or the types of headphones you need to have depending on the activity that you have. So that’s the one and my other audio activity thing is when I’m not wearing a headphone I sometimes use a bluetooth portable speaker. I like this one called the Ultimate Ears Mini Boom which is about $80-$100. Sounds great, looks really well and it has its own app where you can kind of customize the sound and other things like that. Tom Mighell: So I know that some people who listen to the podcast have mentioned the fact that you and I don’t disagree near enough, and unfortunately, this is going to be another area where we don’t and it’s kind of creepy that maybe we’re related somehow. Because I probably am not quite the audiophile that you are but I take the same approach. I have three different pairs of headphones that I use too, depending on what I need them for. I have a pair of Bose in-ear noise cancelling headphones. They’re really light, they’re really portable, they’re great to have, the noise cancellation is just as good as the over the ear; I use that listening to things on the plane. I also use it for conference calls when I’m out of the office, it’s easier for me to hear voices on the conference calls. But I recently started using a pair of wireless earbuds called JayBird BlueBuds. They’re bluetooth and I primarily use them when I’m working out, when I’m walking, when I’m doing anything active so I can put my phone in a pocket, I can put it in a place that’s safe and not have to worry about the cords getting tangled up or catching on something when I’m moving around. And then I’ve got a dirt cheap pair I will always go to TheWireCutter.com and I will look for their most fecent recommendation on best in-ear headphones under $40 and I’ll have a dirt cheap pair with me for whatever I need it for and sometimes those are even more comfortable than these other pairs that I’m using. I have a bluetooth speaker that I listen to around the house, I really don’t listen to it that often. It’s a Logitech X300 that’s serviceable. It gets the job done, it’s not amazing or fantastic. But I tend to not listen to the bluetooth speaker as often as you probably do. Dennis Kennedy: The other thing I wanted to mention when we were talking about USB was that it used to go back in the days when you plugged a laptop into a dock – which you still see and is sort of a cumbersome thing – but it just seems like I have so many things that I’m going to plug in between different iPads, iPhones, backup hard drives, those sort of things. I just really like the basic $20 powered USB hub that allows you to plug one thing into your laptop and then run multiple devices off of it. I think it’s just a really useful accessory. Tom Mighell: So we’re running a little bit long on this segment, let’s maybe finish up by thinking about the things we don’t have, or the things we’re in the market for, maybe things that we’re looking for recommendations from our listeners. Dennis, you got one or two things that you’d like to mention? Dennis Kennedy: It’s funny that you ask that, I feel like the man who has everything now. There are a few things out there and I guess I’ll look more as things change, but I would like to get ideas from people, I guess two things. One is what people find themselves that they just think is so great that everyone should try it, and the second thing is trying to come up with a better way to find reviews to get information about this. Because I think in the whole reviews in finding products is the one place that Google just doesn’t feel like it works for me anymore; so I’ve really been struggling with that. So I think those two things, are there some things that our listeners think are really great or have we really moved to this area of personalization where what I like may be exactly the opposite of what you like. Tom Mighell: I’ve got two wishlist items for me, the first one is I’d really like a useful wireless charging platform. There is a platform that is being rolled out slowly called the Qi Platform; it makes it easy to just lay your phone down on it and it will automatically charge without you having to plug anything in. But your phone and your other device needs to be configured for it, it needs to have that capability and probably fewer phones or devices have them than don’t have them. There’s a couple of wireless charging tools out there that require you to attach something to the back of your phone which I really don’t want to do, I want it to be able to just be seamless. It’s not to the point where it needs to be but that’s coming. Where I don’t think we’re going to get to, my pie in the sky wish, is standard charging tool. If I’m looking in my accessories bag right now, the thing that I have the most of are charging cords for each separate device and there’s nothing that’s really standard. I have to use something different for my Android device as I do for my iPad. My Android phone actually has a dock that I have to put it into. Maybe that’s my fault and maybe I’m just complaining because I’m on so many different platforms. If I standardized on one platform I’d only have to use one charging cord. But I sure would love somebody to bring it all together and find a way that we could charge everything all together with one set of charging tools. Before we move onto our next segment, let’s take a quick break for a message from our sponsor. Dennis Kennedy: And I’m Dennis Kennedy. Tom wrote a great article on multi-factor authentication that was published recently, we’ll link to that in our show notes. With all the stories and concerns about protecting the security of our data and identity, this is an extremely important topic. Multi-factor is probably – might well be – the best way to take an extra step to improve your security that doesn’t put that much more difficulty or complication into how you do things on an everyday basis. Tom, what did your article have to say about multi-factor authentication and maybe it’s best to start by re-emphasizing what it actually is. Tom Mighell: Well, let me start at the basis for the article. What made me think about it was a reporter for Wired magazine wrote an article where he described how he had been hacked. So that his entire online identity, his Google account, his Apple account, his Twitter account; everything was literally obliterated in hours, if not minutes. And it turns out that although the hackers were pretty smart and used social engineering to get a lot of the stuff that they needed to hack into his account, they would have completely failed if the author had done just one thing; and that is turn on two-factor authentication on his Google account, so that it would have stopped them from being able to use his GMail address. Some of you may know what multi-factor or two-factor authentication is. So in addition to a password, that’s usually something that you know, you know your password, you also, with multi-factor, will need something else that’s going to confirm your identity and let you into your account. It could be something you have, it could be a token; lots of companies and law firms issue tokens that you read a temporary number off of as the secondary passcode. It could be something that you are, it could be your fingerprint, it could be your retina scan, it could be your voice. My article really discussed the first type; using a token or a code to get in with a second level of verification. I think that at a minimum – I think Dennis is going to agree with me – we think that two-factor authentication is necessary for the tools where you may have a lot of personal stuff that you don’t want somebody getting into. Dropbox, Google, Apple; places where you’ve got payment information, critical information like your email addresses, critical documents or at least important documents you have, they all offer two-factor authentication. But frankly, you should look at enabling it for any online service that you have. The easiest way to do this is to use an app for your smartphone that’s going to display authentication codes for you. They generate random codes every 30 seconds or so. I first started using Google Authenticator, it’s available for both Android and iPhone, but I’ve recently started using an app called Authy, and I really like it. You can secure the app with your fingerprint or with a passcode and it syncs across all of your devices. And the best part about these tools are they work like the tokens that you might see that are the kind of physical keychain tokens because they work offline. It doesn’t matter if your phone is offline or doesn’t have service, they will still generate codes that these services will recommend. I have found – and I think the experts say – that with this two-factor authentication, you can stop just about any determined hacker in their steps because they won’t be able to get past that second level because that’s personal to you and it’s something that you have access to. Dennis, did I miss anything you wanted to talk about with respect to two-factor authentication? Dennis Kennedy: No, I think that’s great, you showed the highlights. I think that it’s becoming more understandable and more convenient, which are the two key pieces of this. I always like to use your ATM card as the example of multi-factor because it’s something you know, which is the pin number and something you have, which is the card that you put into the machine; and that gets the concept of really easy. I think in the early days, I used to get really concerned about multi-factor because it seemed like they were going to be instant messaging you every time you try to log in and you would need to come up with this special number that was texted to you every time; and that hasn’t really been the case so they sort of figure out better ways to do that. And I think it does relate to this notion where I sort of feel – and the example is in the author that you mentioned – that the worst thing you can do in security these days is to use the same password in multiple places, especially in your most important accounts. So if you haven’t changed all those, then multi-factor becomes even more important. And we used to say two-factor, I think multi-factor now makes more sense because you do have the fingerprint and the biometrics which could be the second factor, or imagine where you need all three factors for certain things. So I think it’s now a lot more straight forward, it’s easier to find these things, it’s easier to turn them on and then you just figure out what makes more sense to you. But sometimes you see something will be – like a set of letters or numbers, will be texted to you or something like that that you have to put in. So a little bit more inconvenience but it’s not too bad and definitely gives you just a much better level of security than relying on your own passwords. Dennis Kennedy: So now it’s time for our parting shots, that one tip, website or observation you can use the second this podcast ends. Tom, take it away. Tom Mighell: So if you had to guess which app developer was developing some of the more popular apps for the iPad, for the iOS and for the Mac systems, you would probably not guess that it is Microsoft, but you would be wrong, it is Microsoft. It’s interesting that Microsoft has developed I think several dozen apps for iOS already; I think I talked about the Outlook app that just came out recently, I’m using it on my iPad all the time. And just this week, Microsoft finally released a preview candidate of the new Office for Mac. I had been using – I had tried – to use the previous version of Office for Mac, which was actually Office 2011 which was missing out on a ton of great features that the Windows version of Office came and updated with Office 2013. They finally updated it to where it is closer to 2013 than ever before; it’s really nice. It still doesn’t have everything if you’re used to using it in Windows, but working on it on a Mac, it’s really nice. And so if you’re a Mac user, right now, it’s free to download. You don’t need an Office 360 account, you don’t need anything. You can download it immediately and start playing around with it and using it; I think it’s a great tool. Dennis Kennedy: Mine is Practical Law from Thomson Reuters and the reason I’ve been thinking about this is I’ve been co-teaching class in intellectual property licensing and drafting at Washington University’s Law School. And we were talking with the students the other day about how you get started on drafting projects and dealing with the legal aspects when you’re giving a fact pattern that asks you to draft, say, a trademark license agreement or something like that. And so Thomson Reuters Practical Law has a tagline that says, “Provides lawyers with a better, more efficient starting point,” and that’s what I liked about it and that’s how I described it and I see myself thinking a lot more about it. If you ever see this product demo, you’ll get the advantage of it really fast. But the notion is curated content, lawyers involved, they collect this starting point information, law summaries, point you to the main cases of forms, other things like that, and it’s all in one place where it used to be where somebody asks you a question, you kind of have to rack your brain. Or you’re on the spot trying to remember when you knew there were 4 different exceptions to something but now you can only think of 3 of them. Now you can go and get the information you need and either when you’re on the phone with someone or before you make a phone call so you can get up to speed really fast on things. So this to me is the most interesting of those types of tools. And I don’t know the pricing on this, I’m sure it’s this sort of thing that you negotiate of depending on the size of your department or firm. But really interesting to me is a next generation approach to providing actionable information to lawyers. Tom Mighell: So that wraps it up for this edition of the Kennedy-Mighell Report. Thanks for joining us on the podcast; information on how to get in touch with us, as well as links to all the topics we discussed today, is available on our show notes blog at TKMReport.com. If you like what you hear, please subscribe to our podcast in iTunes or on the Legal Talk Network site. You can get to the archives to all of our previous podcasts in both places as well. If you have a question you want answered or a topic for an upcoming podcast, please email us at [email protected] or send us a tweet. I’m @TomMighell and Dennis is @DennisKennedy. So until the next podcast, I’m Tom Mighell.